Cosmetic Dentistry MakingDream Smiles A Reality! Making Dream Smiles A Reality! For over twenty years, Dental Dreams, LLC has provided family-friendly dental care to patients throughout the Lithonia, Decatur, and Atlanta, GA communities. Dr. Brian K. Buchanan and Dr. Zerita C. Buchanan, our father/daughter dental team, exceed the expectations of our patients, whether they are in need of a simple exam and cleaning or more advanced restorative care. Our team goes above and beyond to make sure our patients are comfortable. Our main objective is to listen to our patients’ needs and provide education to enable them to make the an intelligent decision regarding their oral health. Please feel free to contact our Lithonia dental office to schedule an appointment and exam with Drs. Brian and Zerita Buchanan. 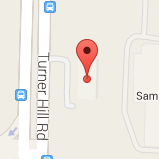 Our easy-to-find location is directly across the street from Rooms to Go on Turner Hill Road at Stone Crest Mall. Call today 404-289-7311!